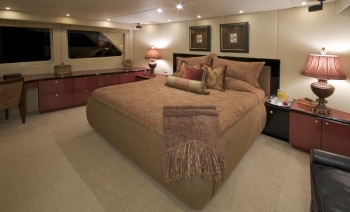 5 King Cabins, 2 of which converts to a Twin + 1 Single cabin with Pullman. 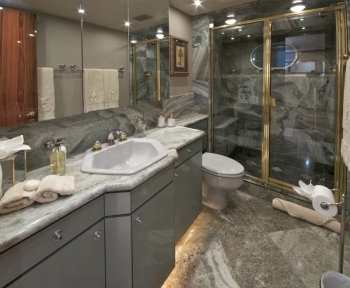 5 Guest Bathrooms. 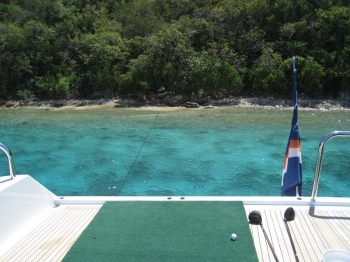 Water Golf with biodegradable Golf Balls. SWEET ESCAPE is under new ownership and promises to be better than ever after a major overhaul. 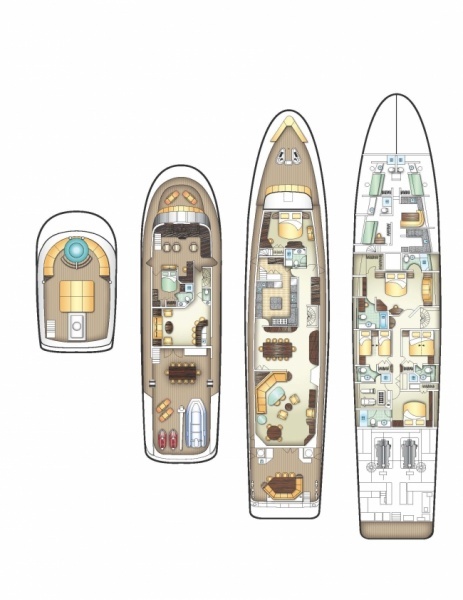 The new charter-savvy Owner is currently converting the gym into a 6th stateroom; adding a day head onto the Main Deck forward of the Main Salon; and refurbishing all ensuite bathrooms, among other upgrades. Two additional Jet Ski’s, including the flyboard attachment will be added to the inventory for a total of 4 Jet Ski’s. 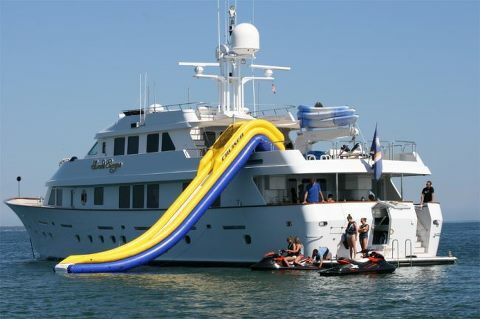 SWEET ESCAPE will continue to offer SCUBA, fishing, and the popular giant water slide is available for all to enjoy. 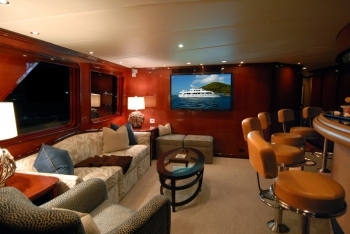 All equipment in bridge being updated, HD TV’s, internet KVH, control-4-home entertainment system, movie server. All exterior soft goods in shades of turquoise, navy and white. 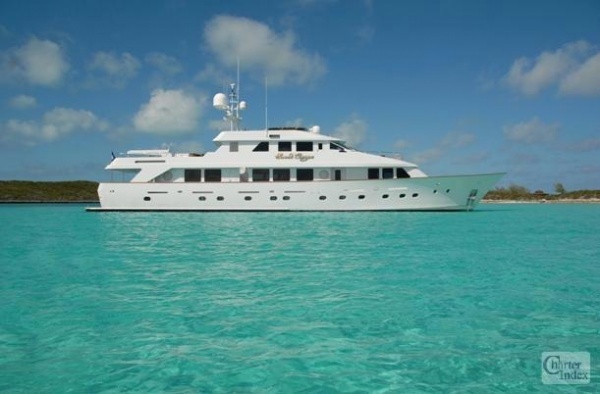 Starting in April, 2017, SWEET ESCAPE will charter out of Nassau for Summer 2017 for $95,000 a week (same rates as always before). 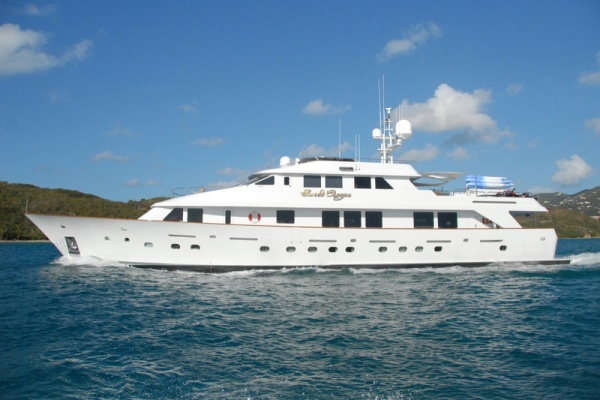 She will return to the Caribbean (St. Thomas) for Winter 2018 (including Christmas and New year 2017/2018) for $95,000 a week, and then she will go to Croatia for Summer 2018. Quoting in US dollars, July and August 2018 will be at $130,000 a week; June, September, and October will be at $120,000 a week. 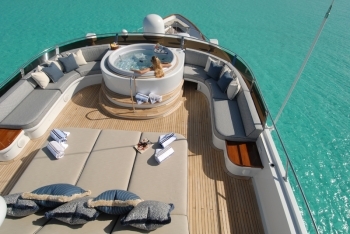 Since Yacht SWEET ESCAPE is not listed on the sales market, the Owner is happy to commit to charters in advance. 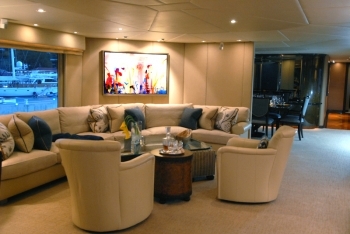 Captain Cuan Odendaal comes to the newly refitted motor yacht Sweet Escape with fresh eyes. Cuan is a global citizen. He has lived all over the world and speaks English, Afrikaans and German fluently. After studying a degree in tourism and tour operations at university, he worked as a marine logistics supervisor at an offshore construction company. Eventually his love for exploring drew him to a career where he could regularly cruise areas off the beaten path, and these adventures continue to inspire him. 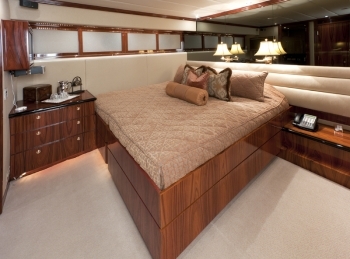 His genuine affinity for the ocean and sailing led him to a career in yachting at an early age. At eighteen he began sailing from his native South Africa to the British Virgin Islands. 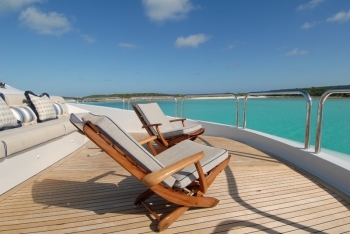 It was then onto motor yachts travelling the Caribbean, Mediterranean and South America. Cuan’s outstanding drive and determination pushed him to gain various maritime qualifications and became a Captain at the age of 24. 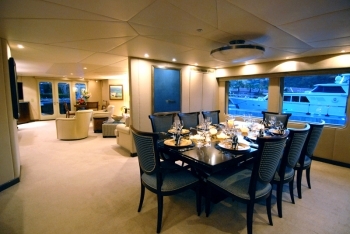 After leading extensive charters in Southeast Asia and Indonesia for 4 years on a 130 ft motor yacht, his vessel won Best Superyacht of the Singapore Boat Show in 2013. 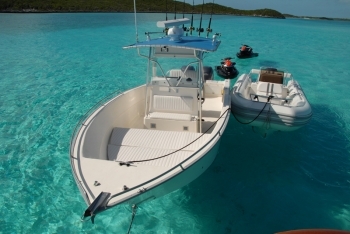 Cuan then returned to Fort Lauderdale to gain his MCA Chief Mate 3000 and Master 350 license and search for a new adventure. Cuan has had a great passion for fishing and sharing the experience with others. He loves taking guests out on fishing excursions, returning with more than just fisherman’s tales. Always upbeat, Cuan enjoys leading a winning crew. He has assembled a team of professional, fun, and well coordinated individuals that will surprise and entertain guests at every turn. Being a Pisces, Cuan is drawn to the ocean and spends a majority of his free time kiteboarding, free diving, surfing and fishing. 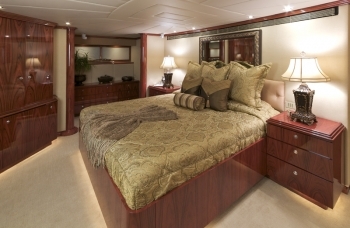 One of the most notable assets onboard SWEET ESCAPE is her 5 King Suite layout, ideal for a romantic couples charter. 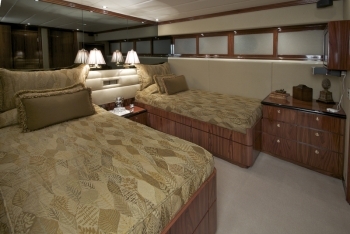 Two of the King Suites are able to convert to twins for family charters, plus now a 6th Guest Stateroom can accommodate children or staff for a total of up to 12 guests. 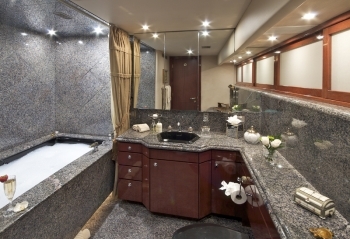 The 6th Guest Stateroom incorporates one single bed plus a bunk bed, and shares an ensuite bathroom with the port side convertible twin/king guest stateroom. 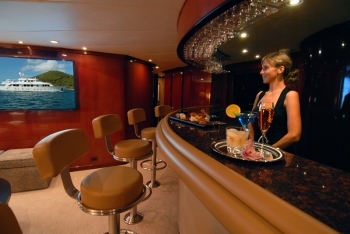 SWEET ESCAPE has a main saloon, a formal dining saloon, a skylounge with Blu-Ray, a Skylounge bar, a Full Beam Master Stateroom below with His and Her bathrooms (Jacuzzi for Her;Steam Shower for Him;)a VIP King Stateroom located on the main deck; Marble Guest Bathrooms, Various Day Heads, Bow Seating, Tender and Toys, 2 Convertible Twin/King Staterooms, Covered Aft Deck Dining, Covered Bridge Deck Dining, Sun-Deck with Jacuzzi and Optional Sun Shades, and Water Golf with biodegradable Golf Balls. And more! New Interior and Exterior Photography is scheduled for March 2017. All new Marketing tools to follow soonest.